Peter Rollins is an author, speaker, emergent church thinker... His most recent blog article was titled, "My Confession: I deny the Resurrection" It is worth the read. He may surprise you. I am four days into my ‘Lessons’ tour and so far loving it. My time to date has been spent in Calvin College engaging in fascinating debates with Kevin Corcoran, Jason Clark, Jamie Smith, Lori Wilson and Michael Wittmer. Many subjects have been covered, but perhaps the most pertinent one revolved around the place and nature of belief in faith. 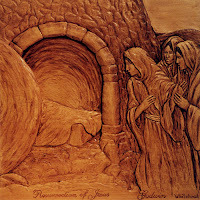 At one point in the proceedings someone asked if my theoretical position led me to denying the Resurrection of Christ. This question allowed me the opportunity to communicate clearly and concisely my thoughts on the subject, which I repeat here. I see Jesus here. How about you?